The firebird arises and consumes Crown-of-Bone on Page 3 of A Berry from the Sun. The remaining four manitou have their work cut out for them. To see a preview of what has befallen Talons-that-Seek, please vote for Snow by Night on Top Web Comics. We’re back from RavenCon. It was a fun time, and I got to see a lot of friends that I haven’t gotten to see in a long time. Our next big convention is AwesomeCon! Woooooo. It’s the last weekend in May and we’ll be attending as guests with the Reverie Crowd. We’ve got an entire island at the convention and eight of our members will be there. I’m really looking forward to it. I’m going to say it again. 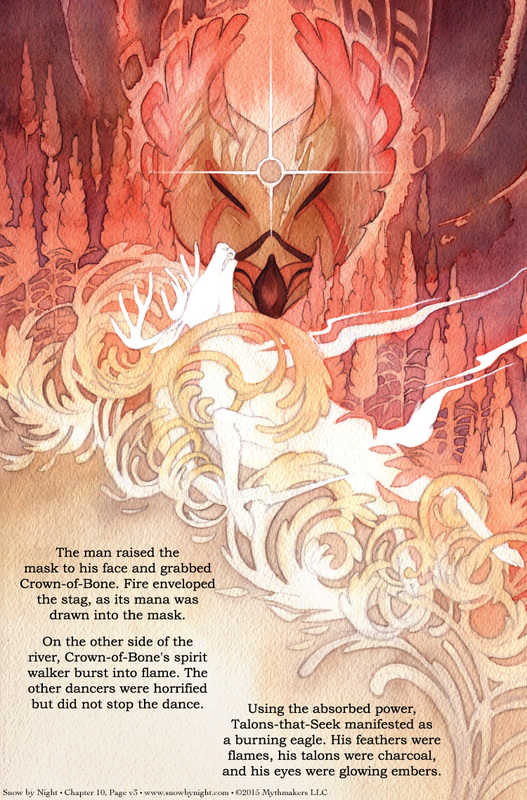 These watercolor pages are gorgeous! Really wonderful composition and color choices! Love it. The storyline so far is fascinating! Wow, this watercolor looks like something I’d see in a museum or something! Isn’t that the same mask of Chapter two?